Every morning, we open our eyes and become immersed in a wealth of visual information. The eyes and related brain structures are a complex system that allows us to experience visual information from the surrounding world. It is easy to take clear vision for granted, but even subtle changes in the structure or functioning of the eyes can disrupt our sight. An eye care provider conducts a thorough eye exam to ensure that these components are functioning together well. The eyeball is not a single, spherical structure as is commonly thought. It consists of a smaller, curved portion called the cornea that attaches to a larger, roughly spherical structure called the sclera (the white of the eye). The eyeball is filled with a jelly-like substance called the vitreous fluid. Toward the front of the eye are three essential structures: the iris, pupil, and lens. The iris is the colored part of your eye. It can open and close to determine how much light to let in through the pupil, the black hole in the center of your eye. Finally, the lens is a flexible, convex structure that changes shape to direct light rays in different directions within the eye. 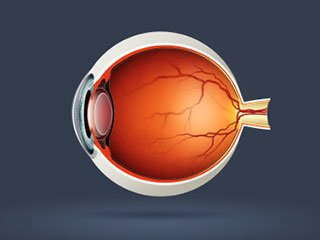 At the back of the eyeball is a layer of tissue called the retina. The retina consists of millions of photosensitive cells that react to certain types of light. Cone cells are clustered toward the center of the retina, and react to colors and details in bright light. Rod cells, which are spread toward the periphery of the retina, react to dim lighting conditions. When light enters the eye through the pupil, it passes through the lens, which changes shape to ensure that the light rays hit the retina. When the light rays reach the back of the eye, it stimulates the rod and cone cells to fire. Cone cells detect fine details and color in the center of your visual field. Rod cells detect edges in peripheral vision and allow us to perceive shapes in dim light. The rods and cones in your retina convert light energy into electrical signals, which exit the eye through the optic nerve, located just below the center of the retina. The optic nerve carries visual information to the occipital cortex in the very back of your brain, where it is processed to result in a rich visual experience. If any part of this complex arrangement functions improperly, vision is impaired. Thus, it is essential to receive regular optometry exams to have your eye structures and visual abilities checked.